Did you know Cascade Heights is home to four major parks all within a mile radius of its' commercial district? These parks, along with tree canopy, are a key piece of our community’s character. As we prepare for new growth of the commercial district, how do we preserve this identity and build on these assets? 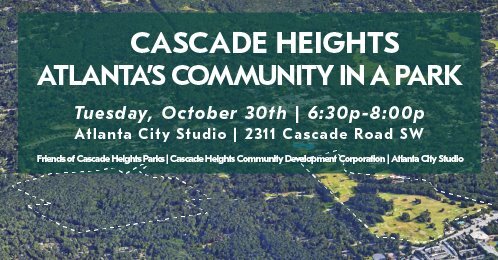 Join the Friends of Cascade Heights Parks, the Cascade Heights Community Development Corporation, and the Atlanta City Studio for a workshop to discuss “the greens” of Cascade Heights. Great article on "Station Soccer"